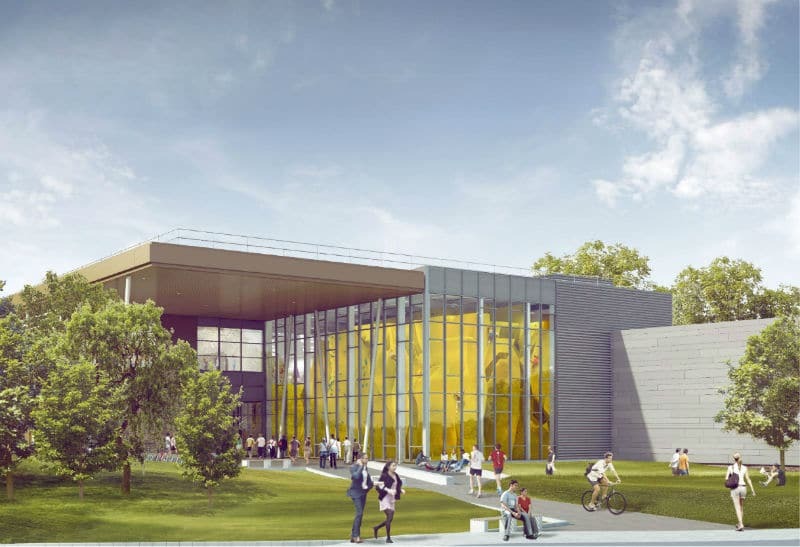 Video has been released of a new sports and wellness hub at the University of Warwick, due to open in April 2019. The facility is being constructed by Wilmott Dixon, part of a £49 million investment in sports and physical activity facilities at the university. The computer-generated footage begins with a bird’s-eye view showing the centre’s setting in the nearby woodland, before heading through the open-plan interior. It goes on to showcase the speed climbing wall, bouldering walls, 230-station gym, swimming pool, six squash courts, and five-a-side and full-size outdoor football pitches. Also featured is the combat hall, which will be a specialist martial arts space. Lisa Dodd-Mayne, Director of Sport & Active Communities at the University of Warwick, said: “This will be one of the finest centres of its kind across the UK and we believe this short film shows that. “It showcases the bright, open, accessible building design which has been at the heart of the build, ensuring that this will be a space for everyone to get active and play sport. To find out more about the hub or register interest, click here.